I³ Risk Management will manage your existing program or develop a new program from one single machine to your entire facility. We provide a turnkey service from field validation to employee training. Our methodology and experience allow us to work well with your team without interfering with production or making unnecessary demands on your skilled tradesmen throughout the process. Contact us to learn more of our complete service. “Hazardous Energy Control Procedure” (HCEP) refers to specific practice and procedure to safeguard employees from the unexpected energizing or startup of machinery and equipment, or the release of hazardous energy during maintenance or repair service activities. These energies are often some of the most dangerous hazards that your employees are exposed to during the course of their work day. 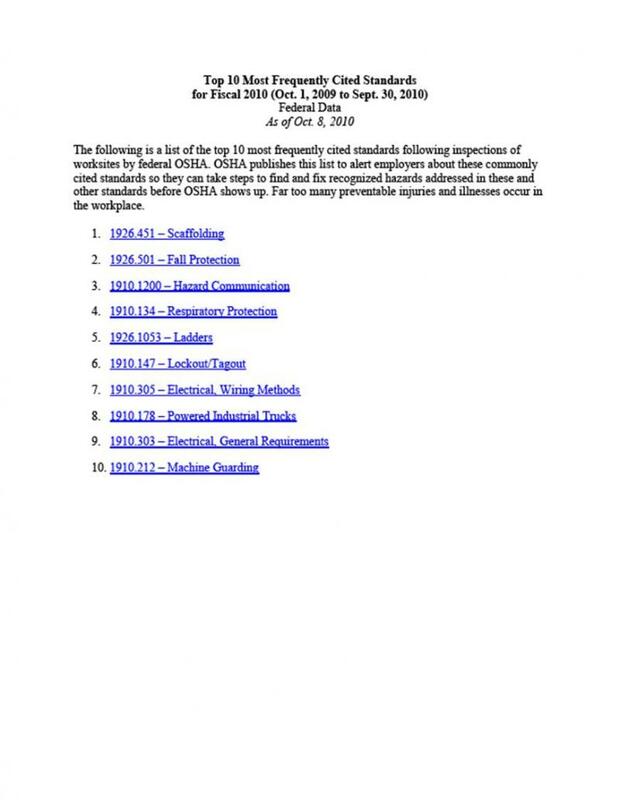 To comply with OSHA Standard 29 CFR Part 1910.147. I³ Risk Management develops machine-specific hazardous energy control procedures (HECPs) for your approval. Our expertise allows timely cost effective development of OSHA compliant procedures used to teach your employees how to manage risk. 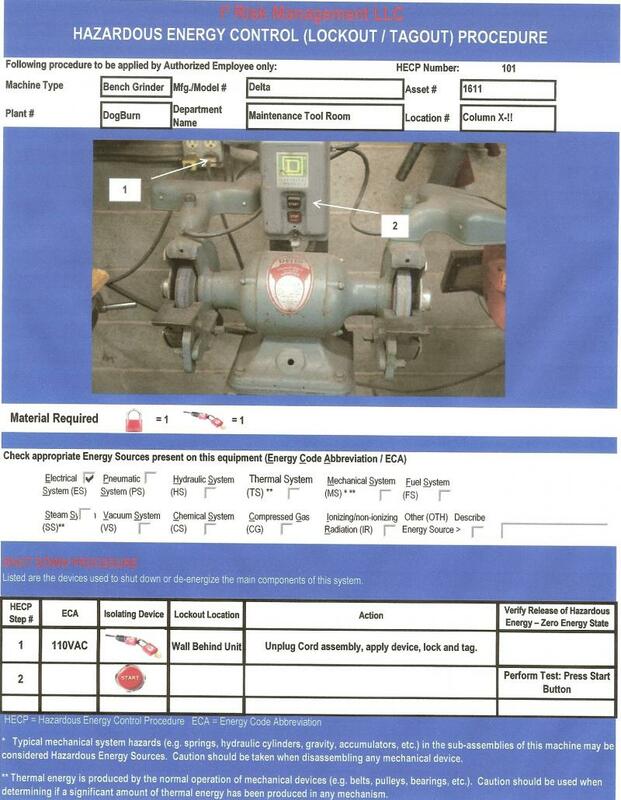 Lockout/Tagout is one of OSHA’s “Top Ten Most Frequently Cited Standards”. Manage your organizational risk; call today for information on our turnkey installation. To comply with OSHA requirements, I³ Risk Management conducts a thorough field survey and analysis of your systems and equipment to identify all energy sources. Main energy sources: electrical, hydraulic, pneumatic, fluids, gases, mechanical energy; these classifications include: flammable, thermal, chemical, water/ coolant and systems. Residual energy sources: kinetic energy can remain in equipment after main energy sources are locked out, spring, flywheel, counterweight and other gravitational motion; stored energy sources can remain in hydraulic, pneumatic, electrical, vacuum, coolant, water, and gas systems and have to be removed to eliminate risk before maintenance or repair service activities are started (block, bleed, break, dissipate or discharge). Adjacent/Associated Hazards: cranes, conveyors, robots and other equipment associated with and/or adjacent to but separate from the instant system must also be considered as potential risk requiring lock out. After field verification, identification of energy source and hazard is complete; I³ Risk Management will determine the best method for locking out the primary energy sources, release residual energy and/or blocking potential hazard to bring your system to a zero energy state. I³ Risk Management captures this information by using digital prints or hand-drawn sketches on I³ Risk Management's LOTO Field Survey Form. 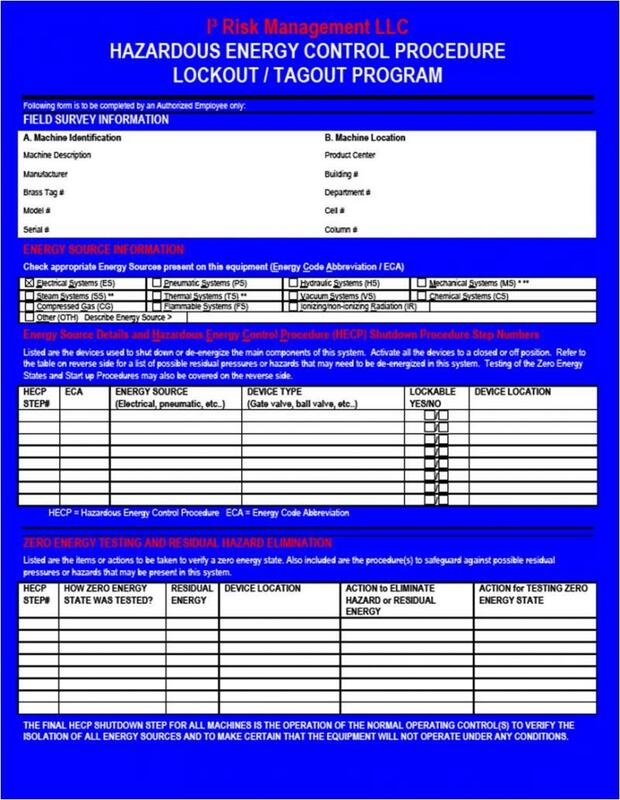 The survey forms are used to create draft machine specific HECPs for your review and approval after which I³ Risk Management will manufacture the final HECP Placard to provide instruction and council for your employees performing maintenance and repair service activities on your machines, systems and equipment. I³ Risk Management installs identification tags at the location of the equipment energy source isolation device to provide immediate definitive identification for authorized employees. photo color paper placard in thick 10-mil UV-protected laminate. Energy source tags are developed based on the standard codes you, the customer determined worked best for your organization’s production and maintenance operations. Placards can be affixed with high-quality, 3M, double-sided tape to withstand the plant environment or mounted with a clear shop ticket holder w/ ¼” mounting grommet. Energy source tags can be affixed with high-quality, 3M, double-sided tape or by using mounting holes w/cable- tie attachment. Materials are selected to resist oil, grease, solvents, and temperature extremes to ensure secure location. 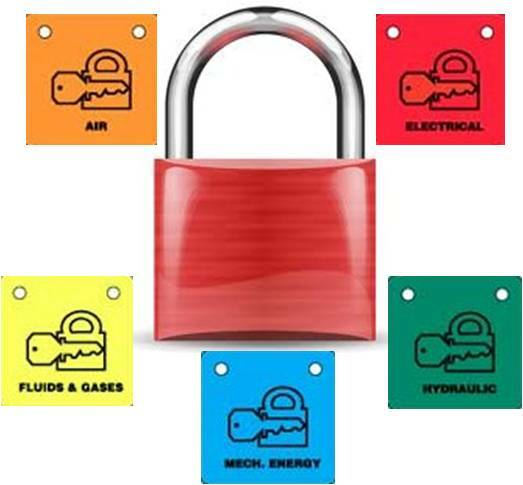 I³ Risk Management will provide you with a full service turnkey Lock Out Tag Out Program Service to include: written program, machine specific Hazardous Energy Control Procedures (HECPs), energy source identification tags, energy source lock out devices, locks, tags and workforce training. We can perform an energy control procedure annual audit s for your continued compliance with the regulatory inspection requirement to ensure that the procedure and the requirements of this standard are being followed by your personnel.